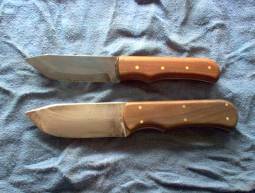 I've been making or modifying knives for the last thirty years. When I am making knives I primarily use a process called stock removal.The knives are first designed on paper, mocked up out of wood and if it feels good, transferred to a piece of steel. Shaping may take place with a vertical mill, bench grinder, or angle grinder before going to the belt grinders. 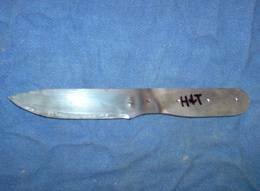 The blades made from new materials are stamped with my name and steel type (sometimes in code) as well as having handle pin holes drilled and countersunk before heat treating. I harden the blades by heating them to 1500-1600F and quenching in oil. The O-1 steel is then ready for immediate tempering, but the ATS-34 and 154CM may be further quenched in an acetone bath cooled with dry ice. Depending on what hardness the final blade needs to be it is either hand tempered with a MAPP gas torch or placed in an oven for an hour at the appropriate temperature. The O-1 blades that are treated this way and tempered at 400 Fahrenheit end up with a hardness about Rc 58-60. I aim for that hardness because it is a good middle point between edge holding and ease of sharpening. Most of the custom knives are a bit harder, Rc 60-64 depending on the steel. After heat treating they are ready for the finish, either polishing the blade, or simply removing the scale from treating. Next comes the handle, a hardwood usually. The handle material is chosen, cut to rough size and flattened on the blade side with the belt grinder. After drilling holes for pins the handles are pinned together and the blade end finished. Everything is then ready to be cleaned and put together. Instead of using an epoxy like JB-Weld I use E-6000B, a black colored rubbery contact adhesive available from auto parts stores. Blades are made from a variety of high carbon steels including: L-6, 440-C, 1095, O-1, A-2, ATS-34, or something similar. I make several standard designs. The basic woods knife is a 7 inch drop point. It is available in 1/16 or 3/32 steel, with a variety of handle materials. I have also made an 8 inch version of the knife from 3/16 steel. 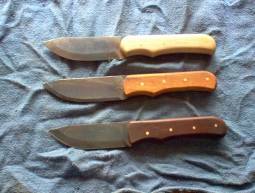 Handles on the knives shown are Maple, Mahogany, Manzanita in the first picture, Ironwood and Lignum Vitae in the second. As the knives are of a full tang design, the handles are held in location with pins that run through the handle, tang, and into the other handle. Metal pins may be made from copper, bronze, aluminum, brass, stainless steel; while other pins may be carbon fiber, antler, or bone. The natural handle materials may include: Elk and deer antler, African Blackwood, Costa Rican Bloodwood, Lignum Vitae, Osage Orange, Olive Burl, Maple Burl, Ipe (ironwood), Manzanita, Eucalyptus, Purple Heart, Mahogany, Live Oak, Honduras or Brazilian Rosewood, Bois D'Rose, Snakewood, and Paduak. Non-natural materials include various phenolic plastics like Micarta and G10. The knife that I started out making years ago is a very simple design. I am still creating it from 1/16, 3/32 and 1/8 inch steel. 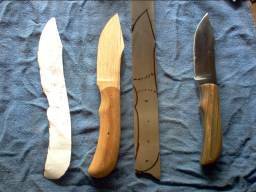 Here you see the 8 inch version, Osage Orange, Elk (antler), Ironwood and Maple handles. 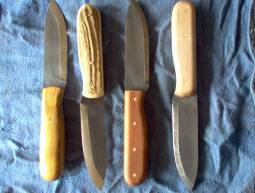 Due to the handcrafted nature of the knives there may be slight variations. Natural handles may swell or shrink with heat or moisture to some extent, simply sand with 220 or finer grit sand paper and then re-oil. The natural handle materials are treated with a 50:50 mix of beeswax and olive oil when I make them. Keep blades clean and sharp, all blades should be lightly oiled to protect from rusting as even the stainless means just that. Please check out the currently available knives here. If you would like to order a knife contact me about pricing. If you are interested in having a custom knife made, send me a full size sketch with blade thickness noted and handle material first and second choices listed. I will send you a quote ASAP.